Years ago, walk down any British town’s high street, and you’d find a clutch of entirely predictable shops. A baker, a greengrocer, maybe a fishmonger if you were lucky, and a butcher. The explosive growth of the supermarket and our hunger for the convenience of shopping for everything under one roof with a big car park outside put paid to many of these independents. True, many still remain, but when I drive past the row of shops where I grew up, in the newsagents, it’s hard not to notice that the baker, the hardware store, the greengrocer and the butcher have all gone, with our old newsagent a shadow of its former self and only an always mediocre fish and chip shop remaining intact. For the people of that area, the ability to shop at a local butcher has gone, swallowed up by the enormous Morrison’s not far down the road. This leaves a gap in the market. Of course, supermarkets do their best, but they’re not artisans, and sometimes people want a little more for their money… not necessarily in quantity, but in quality and difference. It’s into this gap that companies like Keevil & Keevil have neatly slipped. Keevil & Keevil are a famous name in British butchery. They’re the oldest trader at London’s Smithfield Market, and parts of their organisation date back to 1794. As a wholesaler, Keevil & Keevil supply some of the best butchers in London, and their Internet shop is an offshoot of the retail store at Smithfield. One of Keevil & Keevil’s strengths is unusual meats, so there’s plenty of game and charcuterie, as well as wagyu beef, a range of black and white puddings, and plenty of haggis. The only thing I’d take issue with is the presence of a vegetarian haggis. Orders are delivered in substantial, heavily insulated boxes, packed with ice and polystyrene. My order was delivered just after I’d set off for work and sat untouched in a reasonably warm dining room all day. When I opened it up in the evening, everything was still fridge cold and in perfect nick. So, what of the meat? I tried one of the weekly meat boxes, enough for two apparently very, very carnivorous people, which contained a free-range chicken, a topside joint, a big pack of sausages, four lamb chops, two sirloin steaks, half a kilo of minced beef, and two pork steaks, for £42.50. Not bad value, considering the amount of meat involved. 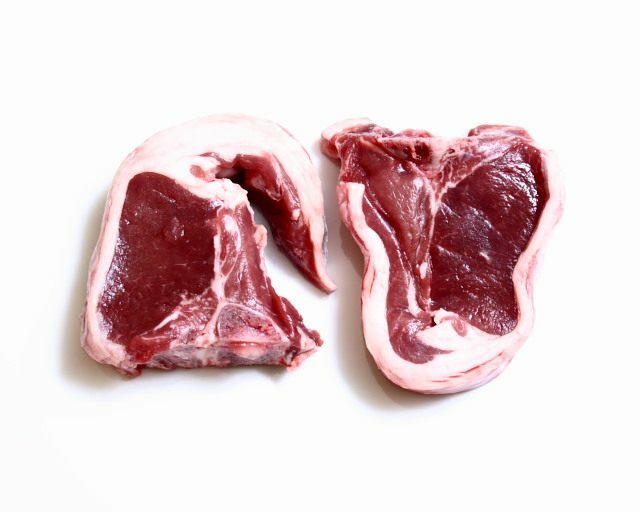 On top of that, it’s great quality – generously cut steaks, lean mince, plump lamb chops…good meat that’s been sourced and prepared carefully. This weekly box seems hefty in isolation, until you have a look at the colossal monthly version, so big that it has to be broken down into four deliveries to avoid literally swamping the over enthusiastic buyer. Each quarter of the order has a different composition, so you won’t be eating the same meat week in week out. How anybody manages to use up 3lbs of black pudding is beyond me, though. It’s a big box, with a big price – £380 – but there’s a lot there, and that price is a hefty discount over normal retail rates, so perhaps worth the outlay as long as you’ve got a very big freezer handy. I think that good meat is worth paying for. It’s worth eating less meat if it means that you eat better meat when you do, and you’re not likely to get meat as good as Keevil & Keevil’s in a supermarket any time soon. Keevil & Keevil sent me a weekly meat box for the purposes of this review. I’m buying another one. I have used Donald & Russell in the past and they are very good. Westin Gourmet are also another lot who I might try? in your opinion – are K&K the ones to try? Used them once, meat very odd tasting. No response to emails and phone never answered. Speaks for itself I think.